I had taken lot of photos at Mahim that evening but lost them due to issues with my phone which led to my finally buying a new one. I retrieved a few of those from my Twitter feed and you can also find some more in the Facebook video posted at the end of this post. 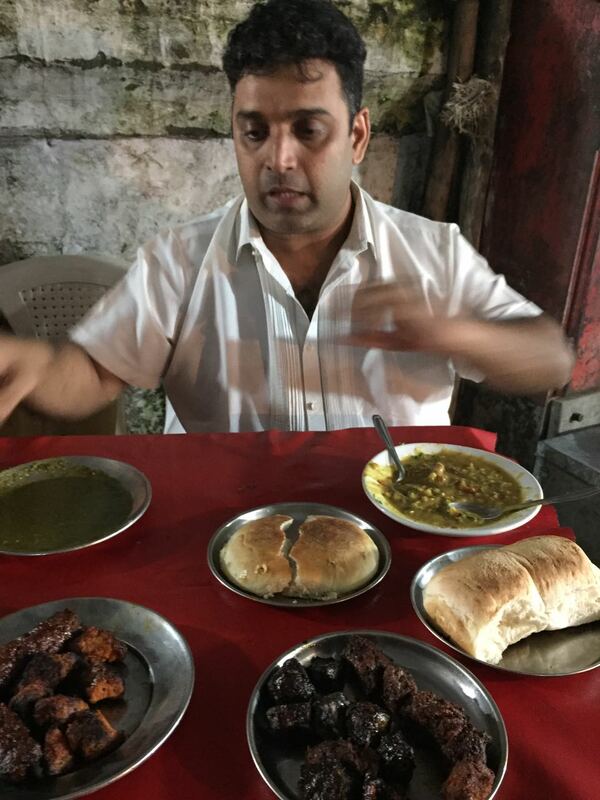 In case you read my previous blog post till the end then you would know that we were all set to head out to Mahim after having had the brilliant seekh parathas at Nawab’s in Kurla a couple of Fridays back. 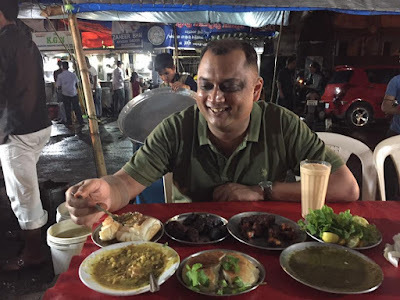 I was with chef Aloo that night and he wanted me to try out a variety of kebabs across Mumbai and see the differences between them. We went to two places that evening. Nawab Seekh Paratha at Kurla and then Raees Kabab Corner at Mahim. Read on to know what happened. We booked a cab once done at Nawab's but our Uber (or Ola) driver couldn’t locate us by the GPS at Kurla. A kind bystander, whom he gave the phone to speak to us for directions, got into the cab and drove down with him to show where the Kalpana theatre, where we were, was. The good Samaritan, got out when the cab reached us, smiled and waved and walked back home. The ride from Kurla to Mahim by road thankfully didn’t take long on a Friday night at 10.30 pm. Aloo had insisted that we go on a Friday as he said that Mahim is more festive then. To see Mahim at its most festive he said, one should go during the Urs mela in winter. Which, if you live in Mumbai, you would otherwise know of as the cause of snaking traffics jams at the end of the year at Mahim. We reached the Mahim Causeway and then got off at the lane leading to the Mahim Dargah (Mosque). If you are facing South Mumbai then this falls to your right. Near restaurants like Meeraj. You can't see the Dargah from there but you can ask people for directions and they will point you to the gulley. Ask for Baba Falooda otherwise. We walked down the lane, past the Baba Falooda shop at the start of the lane and then a stall selling paratha and halva and then past one which sold pulao, a very salty one at that as we found out later that night, and a fruit juice stall. The lane forked after that and that's where I spotted three roadside stands selling various types of street food dishes. Kebabs were being grilled on an coal fired open barbecue at one of the stands. The next stand was for ‘tava items’. Bheja fry, gurda masala etc. The third was a khichda stall. On asking, I found out that all three belonged to the same owner and made up the Raees Kebab Corner. Opposite it was a stall which said ‘Nawab Seekh Paratha, same as the place that we had gone to at Kurla. Aloo wasn't sure if the ownership was the same. Our destination though, was Raees Kebab Corner which didn't seem to have any signboard. The food stands of Raees were set up at the edge of the road. On the pavement behind it was laid out a long table and by it, plastic chairs. A setting reminiscent of Mohammad Ali Road during Ramzan but without the frenzy of the festive crowds. Raees operates through the year and not just during the month of Ramzan. It opens for evening after sunset. I saw the person manning the tava add some oil or dalda on to it and then finely chopped onions, tomatoes and whole jeera seeds. I wondered which part of a goat would be added next. Brains? Kidneys? Liver? Testicles? Tava cooking is all about offal meat in Mumbai. Unless you are at a pav bhaaji stall of course! He added rice instead to my surprise. That would be normal at a pav bhaaji and tava pulao place but I have never seen a pulao being made at a gurda kaleji joint. Intrigued, I asked the cook what he was making. “What will you add to it? Can I have a plate?” I asked. I then followed Aloo’s lead and joined him by the table set at the pavement. Unlike the all male crowd at Nawab’s at Kurla, there were families and women sitting here and eating. Aloysius Dsilva or Chef Aloo. 'Mutton' at Raees Kebab Corner means buffalo meat as I found out. The only meat that they use here. The food was brought to us soon. First the khichda which was taken out of a deg and then the kebabs. let me tell you about the kebabs first. The style of cooking of the kebabs at Raees was very different from that at Nawab’s. The kebabs had a visibly high amount of masalas and colour here compared to the seekhs at Nawab’s. The focus at the later was all about the flavours of the meat while at Raees Kebab Corner, its was the spices that dominated the taste. The seekhs at Raees were drier compared to the juicy ones at Nawab. The khiri was overdone too and I prefer the ones that I have had Haji Tikka at Bohri Mohalla. The liver, again, a bit tough and overdone. The one kebab that stood out at Raees Kebab Corner was the boti (cubed pieces of buff). The meat had a fair bit of juice left in it and the texture was pleasing. Here the masalas combined with with the spices to make for a hearty and bold dish that deserved your attention. There were no parathas made on site at Raees unlike at Nawab. We had our kebabs some pav and baked naan on the side. The naan is the sort you get at Muslim bakeries in Mumbai and are served during Ramzan too. It is a dense bread and entirely different from the fresh naans made in tandoors in Punjabi and Mughlai restaurants. My sort of chef's table. Raees Kebab Corner. Contrary to its name, kebabs are not the high point at Raees Kebab Corner. The show stopper here is the khichda as I discovered that night. Khichda is a traditional dish belonging to the Muslim community where, from what I gathered, dalia or broken wheat, a mix of pulses, spices, chunks of meat (buff in this case) are slow cooked in a deg (cauldron) full of water. Six hours of cooking goes into the making of the khichda at Raees Kebab Corner. 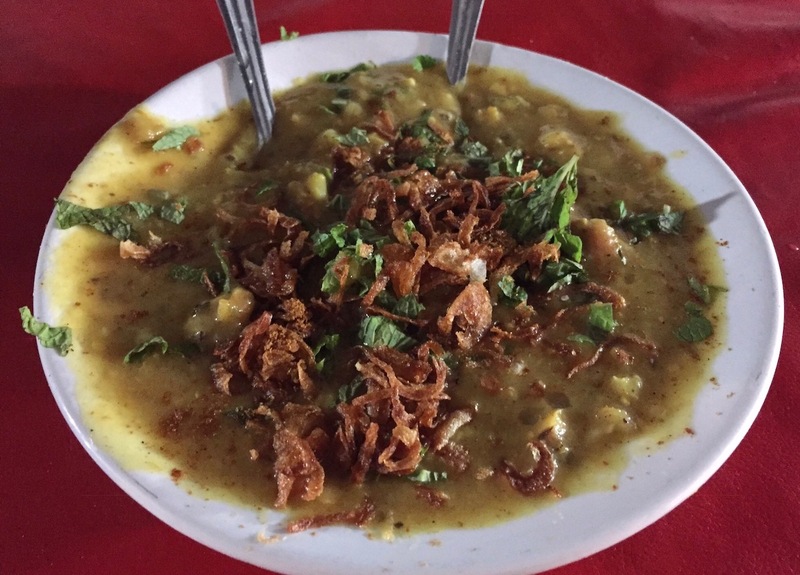 Once you place an order, they take out a serving and add a garnish of birista (deep fried onions), a sprinkling of spices (chaat masala for want of a better word and this would differ from cook to cook), mint and coriander leaves and sliced lime on top and the dish looks quite pretty when it is served. Khichda is different from the Haleem of Hyderabad, which is another slow cooked meat and both are winter dishes. While the texture of haleem is pasty and rich, the khichdas that I have come across are more runny and the ingredients hold their individual form and taste distinct from each other. Both started as poor man’s food from what I understand. Like the Bara Handi style of cooking, these too were ways of converting cheap and discarded, tough cuts of meat into hearty and nourishing meals that were fairly inexpensive too. This was the stuff armies once marched on too. Now I have a confession to make. I have had khichdas at Bohri Mohalla and Mohammed Ali before and never really took to them. I would find them under-flavoured and the liquidy texture didn't work for me. It turned out that Aloo had a trick up his sleeve to fix that. “The actual taste of the dish comes from the condiments, the birista, the masala and the squeeze of lime. The slow cooking technique is for breaking down the protein and making it edible and not so much for the taste,” explained Aloo as he took two spoons and begun to mix the khichda the way you would mix pasta and sauce in a pan. Once he was done, the khichda looked very different from the prettily plated dish of khichda that we had been given earlier. The khichda now seemed more like a kindergarten kid's pishpash but that’s also when the magic happened. I took a couple of mouthfuls of the khichda and then broke into a big smile. Each spoon was bursting with flavour. The core spicing reminded me of that of the dal gosht of the Noor Mohammadi Restaurant . There was a touch of inherent tanginess to the dish that came of from the squeeze of lime that Aloo had added I guess. The meat was soft after the six hours of TLC that it had been showered with. The bite of the dalia was nice too. Not too hard or chewy and yet putting its hands up to be counted in the dish. The harmony of the semi-thick dal broth, the graininess of the daliya and huggable chunks of meat was the suff legends were made. The pretty plating of the khichda was not just ornamental I realised. Every part on the plate had a role to play. The khichda at Raees Kebab Corner was indeed Friday first day, first show material to use Bollywood lingo. We washed our food down with the curiously named 'apple juice' that Aloo had called for from the stall next door. It consisted of chilled sugary milk which had been blended a generous serving of apple slivers. “Did you notice how you can taste bites of the apple in every sip? They don't believe in lip service here,” asked Aloo proudly. I then found out that the sugar rush of the milky apple juice was not the sweet ending that Aloo had in mind. “Let’s have some falooda,” he said. Aloo smiled, made me retrace our steps to the beginning of the street where the Baba Falooda shop was. There was a sea of people standing there. Men and women, boys and girls, folks of all age groups, communities and class. Some were standing on the road and eating faloodas. Others waiting in cars parked outside to which waiters would walk to with steel cup holders full of cups of falooda. Aloo pointed to a doorstep by the stall and told me to wait there. Soon a waiter came up to us and gave us two plastic cups full of falooda. A mix of three types of ice cream, generous chunks of kulfi, dried fruits such as pistachios, synthetic flavoured sugar syrups, and boiled vermicelli (sevia) went into it explained Aloo. Traditional Indian food is often looked down upon as being not presented prettily enough. You will often have Indian chefs who have gone abroad tell us how what was done back home was not in keeping with international standards. It's not just them, us bloggers and Instagrammers too look to the west for food styling inspiration. Now look at the picture below of the Baba falooda in the plastic glass, all of 80 Rs (160 for both glasses), served on the streets of Mumbai, and tell me if this is not a work of art. The other problem folks from the west have with Indian desserts, and I do too now, is that our desserts are uni-dimensionally sweet. Well it was not so in the case of the Baba falooda as it turned out. 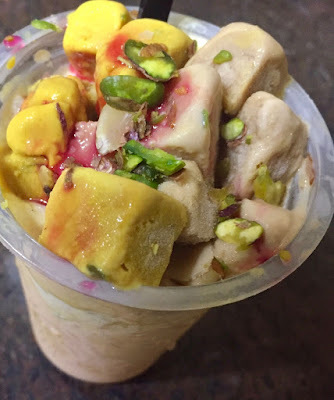 I think they had added a pista kulfi or ice cream to the mix and that gave that slight touch of salt which balanced the sweetness of this kulfi which led to a chilled and refreshing promise of a good night's sleep and sweet dreams. These days, I usually have a few bites of dessert, if at all, as I trying to avoid excessive sugar and sweets, and prefer to share them with others than finish them by myself. That was my plan with the Baba falooda too. However, if you saw it when I was done and chucked my plastic glass into the bin kept inside, you would see that my glass was completely empty. That’s how much I enjoyed the falooda! We called it a night after that and jumped into a rickety black and yellow Omni cabs headed back home to Bandra. 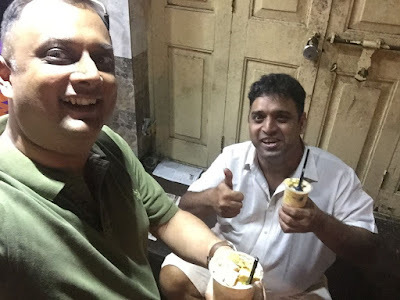 We agreed that there couldn’t have been a more apt closing ceremony to the night of delicious experiences than the double Baba falooda, one by two, that we had at the end. I must mention that my stomach was quite fine later that night despite the street food explorations. No heartburn, acidity or the runs. Eating food that was freshly prepared helped perhaps and good quality produce used. The high turnover wherever we meant that nothing would be stored till the next day. It's India's Independence Day tomorrow and I would like to leave you behind with a thought on how food has the power to unite. That night after all was about a Hindu and a Christian by birth enjoying belonging to the Muslim community, surrounded by fellow devotees of good food, all looking happy. This is the spirit I hope we can build on as there is nothing like the present moment to make a fresh start. The Double Baba Falooda cost us Rs 160 and they gave it to us in two glasses. The food at Raees Kebab Corner came to around Rs 300 in total but I am not sure to be honest. Check this video for more pictures of our night out. The first half is Kurla and then the second half is Mahim.